Every year as Earth Day approaches, conscientious Mother Earth lovers all over the world begin to look at their total impact on the environment. Pledges are made to stop using plastic bags and water bottles, people ride their bikes and carpool to work, and some give up meat for at least one day a week. These are all admirable vows to protect the environment and we applaud and encourage them. What about changing your eating habits so that they’re more sustainable, too? Here are 3 easy steps to get your green on every meal. OK, so the first step to greening your diet isn’t exactly the eco tip you were expecting, but we can’t stop talking about leafy greens around here. Just add a plentiful supply of dark leafy greens vegetables to supersize your healthy diet. Try kale, an excellent source of vitamin K – it reduces inflammation, boosts cardiovascular function, and aids in overall body detox. Then try collard greens. Much like kale, collard greens have off-the-charts levels of vitamin K.
How does this all relate to environmental consciousness? When you eat better, you feel better and make better decisions, so preserving the earth is a no-brainer. To get you started, try one of our healthy recipes: Bitter Greens with Walnuts. Studies show that organic food is tastier and better for you, but is it better for the environment? According to the Natural Resources Defense Council, yes. By eliminating massive quantities of toxic pesticides and synthetic fertilizers used in conventional farming, organic methods help protect the health of our air, water, and soil. Another benefit of organic farming is that it raises animals without the use of antibiotics, so it does not contribute to the growth of dangerous antibiotic-resistant bacteria. The best way to reduce food miles and eco footprints? 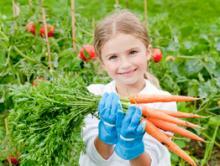 Grow your own food and support your local CSA and farmer’s markets. This might not be the easiest tip for some, but it could be the most satisfying. Reaping the bounty of your labor straight from your back yard or urban dwelling is undeniably rewarding. If that’s not possible, find a CSA or Farmer’s Market at LocalHarvest.org. Eating local, sustainable agriculture that is in season reduces emissions and food miles when transporting food from different areas of the world. It also mitigates the harmful effects of factory farming. What are your green diet tips?